Italy is going to be the first market to be closely analyzed from Fiat’s perspective. As 2012 data keeps coming I will be first analyzing the countries as long as I get the information, and then will come the analysis by region/market, group (Fiat and Chrysler), brand, model, segment and origin. Fiat-Chrysler sold a bit more than 4 million cars last year, and Italy was the third largest market for the alliance (after USA and Brazil). Fiat rules with comfortable margin in its homeland no matter the bad situation the whole market had last year and will continue to have in 2013. The group (which is composed by Fiat, Lancia, Alfa Romeo, Jeep, Ferrari, Maserati, Fiat Professional and Iveco) sold 415.244 passenger cars plus 52.566 LCV (Fiat Professional and Iveco). Due to the fact that there isn’t data available for the LCV market, this analysis will be concentrated in passenger market. Italy had the worst fall among European major car markets. The reasons for this fall are mainly explained by government’s austerity measures that affect consumer’s decision of buying a new car. That’s why only 1.4 million cars were sold last year compared to 1.76 million in 2011. Compared to that year, sales fell a massive 20%, but 2011 was a bad year too. On a 5 year comparison, the fall is an alarming 44% or 1.1 million cars. That’s a lot in a country where car industry accounts for 11% of its GNP (Anfia). Italians stop buying cars because credit is harder to get. Because taxes and maintenance costs are higher and uncertainty rules when is about job. Besides the gas becomes more expensive. However just as said by Brembo’s CEO, Alberto Bombassei, the passion for cars is still there and no matter the bad times or the rise of non-direct competitors (like electronic devices), most of the people will always desire a car. Last year’s result places Italy as Europe’s fourth largest car market behind Germany, UK and France and ahead of Spain, where sales dropped too but now is just half of the way from Italy. The composition of the market by brands did not change a lot. 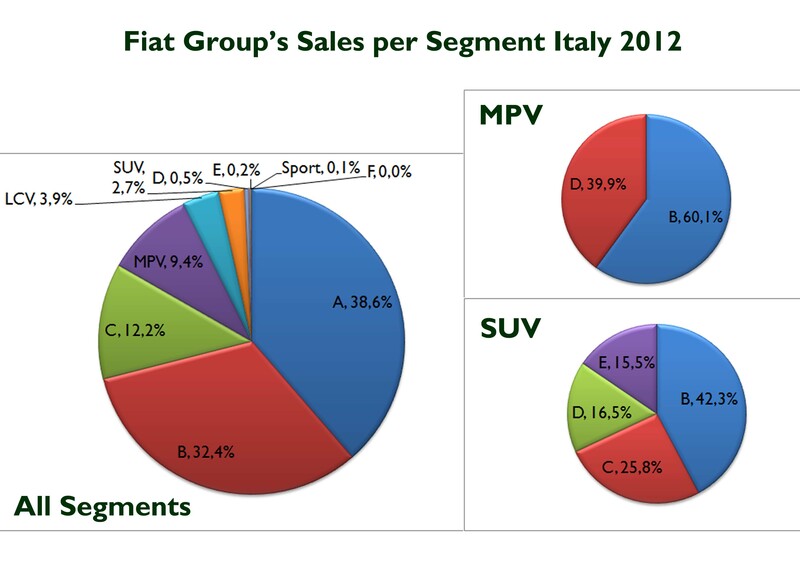 Fiat Group rules with 29.62% of market share in passenger market and 38.85% in LCV. After Fiat comes VW, PSA, Ford, GM and Renault in the same order of 2011. From them the lowest fall comes from PSA, down 13.4%, while the other ones fall from 19% up to a shocking 32.6% in the case of Ford. After Renault the ranking changes year on year. Hyundai, whose spectacular growth took place in most of European markets, ranked # 7 (in 2011 it was # 11), up an incredible 12%. Thanks to Kia, the group from Korea raised its share from 3.6% to 5.03%. There is a lot of concern in automotive executives about this trend and that’s why some of them argue that it is the consequence of the FTA Korea-UE, which only benefited Korean car makers. However it is important to mention that a big part of Hyundai-Kia sales in Europe comes from cars made in Europe. Down in the ranking, only JLR increased its sales thanks to Land Rover and its Evoque. In other words, what GM, Ford and Renault lost was gained mainly by Hyundai and PSA, while the other big car makers (Fiat and VW) remained stable. In terms of segmentation there were specific facts to mention. Though Italy is one of the few big car markets in which car sales ranking per model is not available I managed to get the ranking of the models which accounts for 89.2% of total market. Based on that, is possible to say that once again small cars rule in Italy: A and B-Segment cars accounted for 53% of the total. Then comes SUV and MPV, both with around 13%. 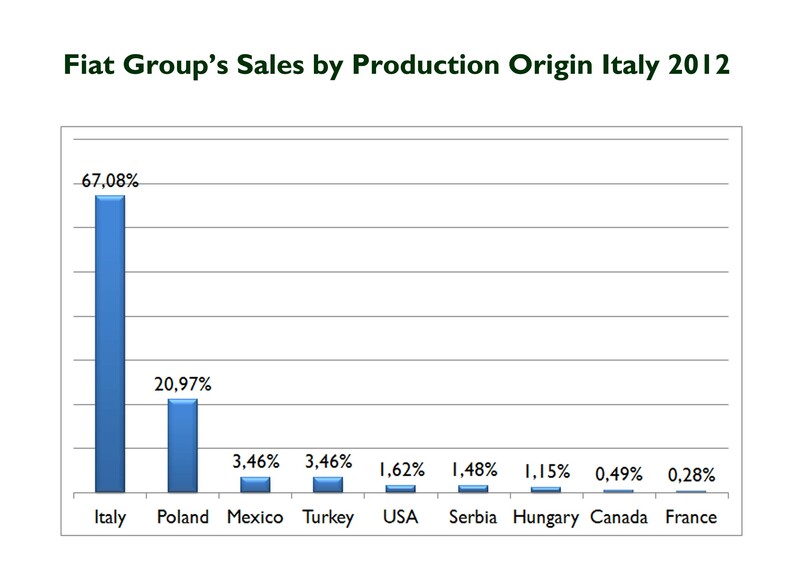 And contrary to what happens in most of European markets, C-Segment occupies place #5 with 12% of the total. 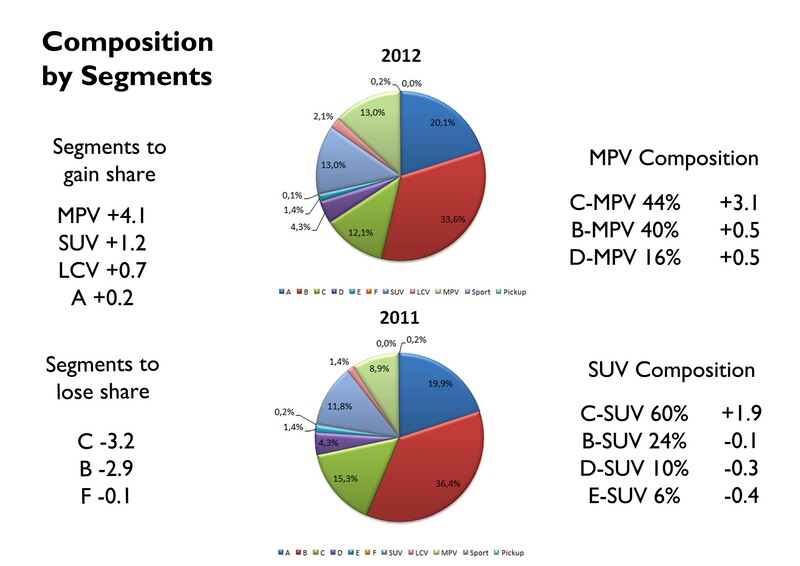 Compared to 2011 data, the segment with the highest growth in share was MPV (mainly because of mid size ones), followed by SUV. In the other side, C-Segment’s share dropped 3.2 points (the fall of the leaders: Golf, Giulietta, Astra and Focus), and B-Segment, down 2.9 points (Punto’s fall). However these preliminary results may change as more data should be available in the coming months. Fiat and Chrysler sold 415.291 cars in 2012, down 19.5% or 100.629 units. Its share raised from 29.35% to 29.62%. Last year’s result is what Chrysler Group sells in 3 months in USA, and Italian total is a bit more than the total sold in one month in USA. It means the position of Fiat in Italy keeps being the best of the group in the whole world, even though in terms of units, Italy occupies place number 3. Compared to its rivals, the group is ahead of the second place by 16.38 points or 229.679 units. It is not a bad gap. If the comparison is made in terms of time, 5 years ago Fiat, Lancia and Alfa Romeo sold 780.854 units in Italy, so the fall is extreme: -47.7%. 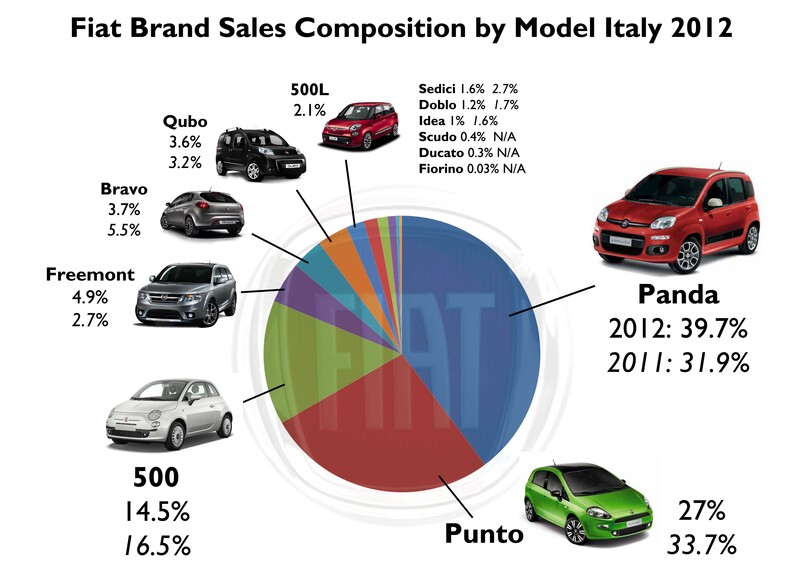 Last year Fiat and its brands sold half of what they sold 5 years ago. It is certainly bad and explains why most Fiat factories in Italy work at 50% of their capacity. The group follows the market’s trend but gains a bit market share thanks to specific products that liked Italians but also were part of corporative purchases. In fact 18.3% of total sales corresponded to that kind of purchase, increasing its share from 2010. Car rent purchases share grew from 13.16% in 2010 to 17.86% last year. Normally both non private purchases correspond to Fiat Group models such as the Giulietta, and large Lancia (corporate purchase) and Panda, Punto Ypsilon and Giulietta (rent car purchase). The analysis by brands must be done separating them into 2 groups: those brands with normal falls, and those with extreme decrease. 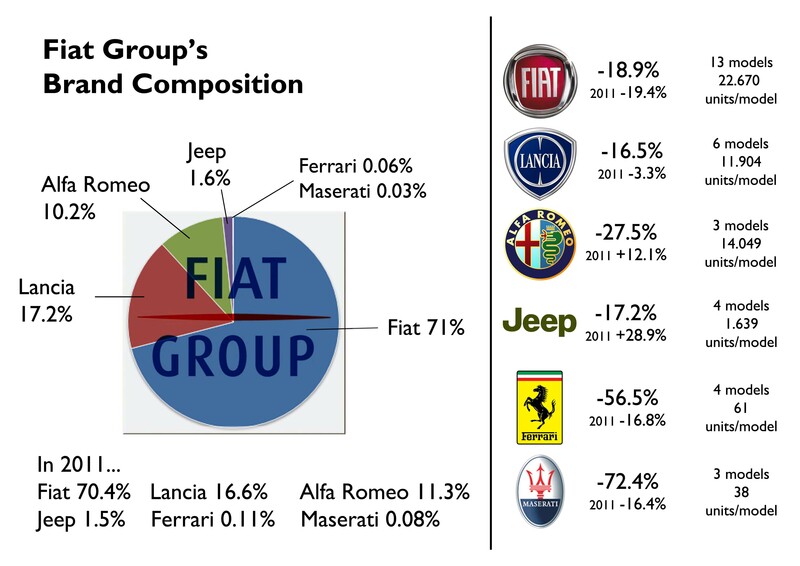 Fortunately for Fiat, the brands with controlled fall are the ones that count more on total sales: Fiat, Alfa Romeo, Lancia and Jeep. 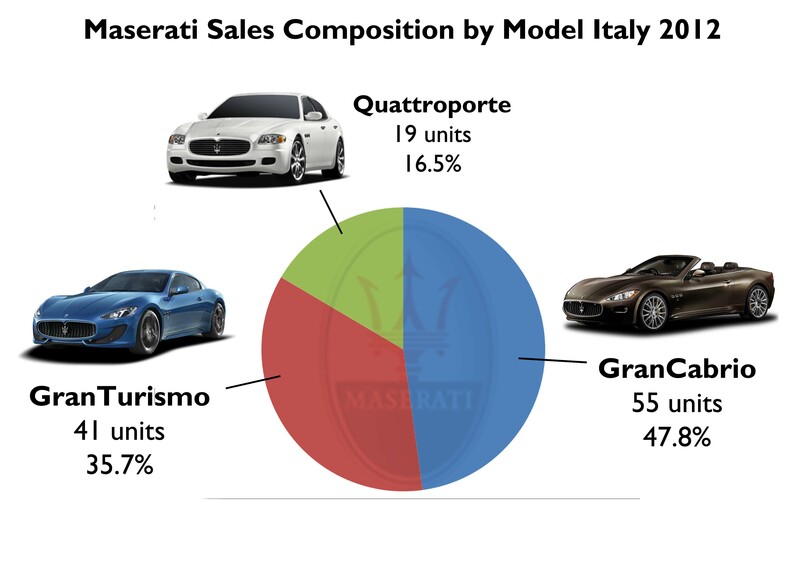 In the other hand Ferrari and Maserati had a terrible year in Italy down 57% and 72%!. However in terms of earnings, these brands are the most profitable, so at the end is not good at all that fall. 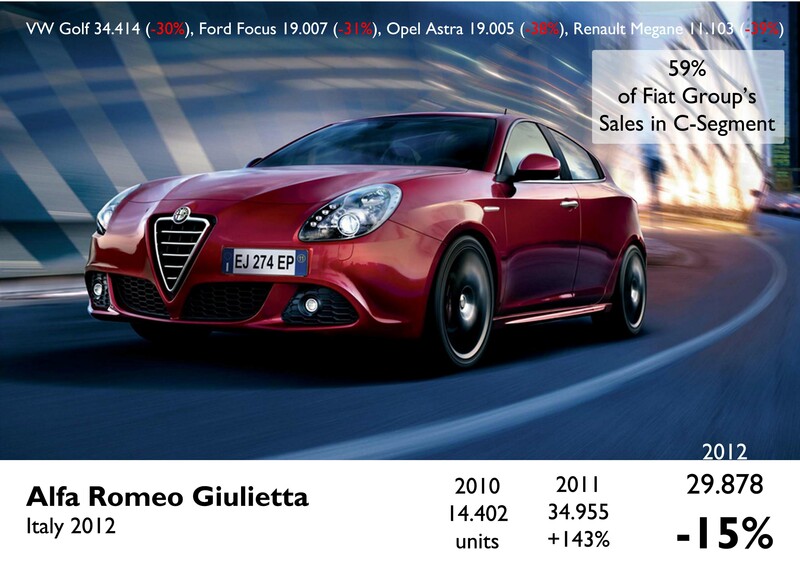 Fiat brand counted for 71% of total sales, up 0.6 points from last year, but down 4.3 points from 2010 results. It is certainly a big number and shows how dependent the whole group is on Fiat and its models. In USA the share among the brands is more balanced: Dodge, which is Chrysler’s best-selling brand, accounts 34% of total sales. 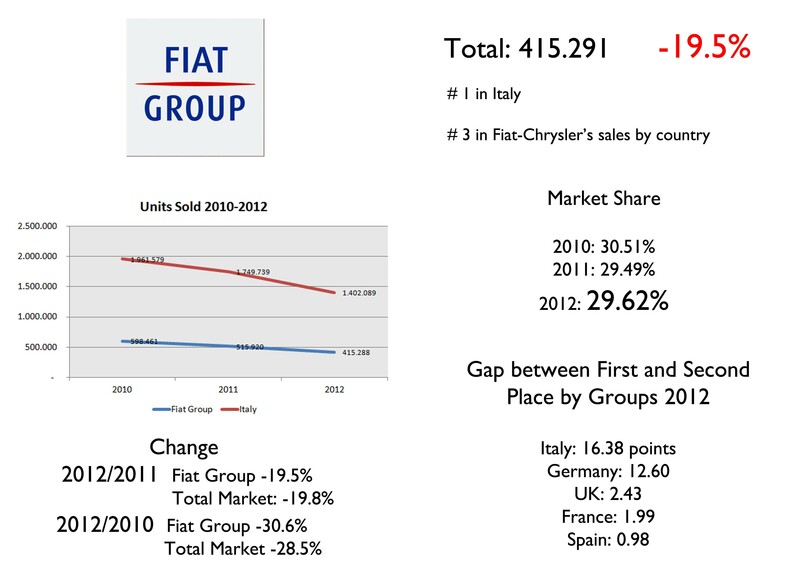 After Fiat brand there is Lancia, with 17% of the total, up 0.6 points on 2011, and 2.4 on 2010. Lancia’s growth means Alfa Romeo’s fall: 10% of Fiat Group’s sales corresponded to Alfa Romeo models, down 1.1 points on 2011, and up 1.5 on 2010. From these 3 brands, Alfa Romeo got the worst fall on sales registrations: -27.5%, which is a lot and is mainly explained by the lack of products as the Giulietta continues to be in top 10 best-selling cars, but is not enough. Lancia fell 16.5%, but a year earlier it fell only 3.3%. The biggest fall last year is explained by Ypsilon’s drop on sales in the last months of the year (maybe because of no more registrations coming corporate purchase of Fiat itself). Fiat’s registrations decreased 18.9%, below total market’s fall. Jeep, which had a record year in 2011, saw its sales fell 17.2% to 6.555 units. The case of Maserati and Ferrari is shocking. What it used to be their largest market, has become a smaller one than Germany or the UK (economic situation explains the fall). 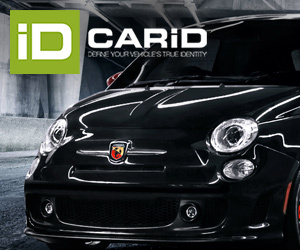 Fiat brand’s sales are 2.6 times higher than the second best-selling brand: VW. A year earlier Fiat was ahead of Ford 2.5 times. If the situation is switched in Germany, VW brand sells 9.2 times more than Fiat. Only second, third and fourth place together would be similar to Fiat’s total: VW, Ford and Opel. 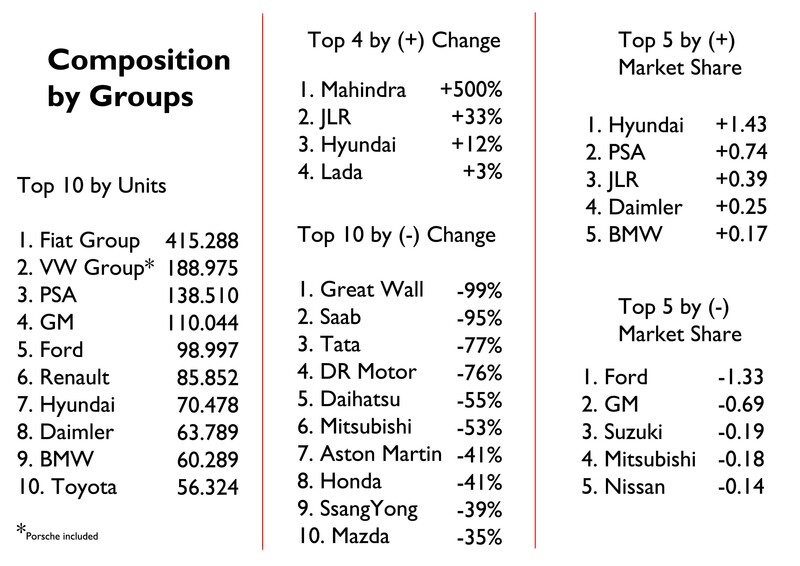 From the top 10 best-selling brands, Fiat occupied place number 7 in terms of growth. It means that VW and other brands had shorter falls, while Ford, Opel and Renault had the worst results. 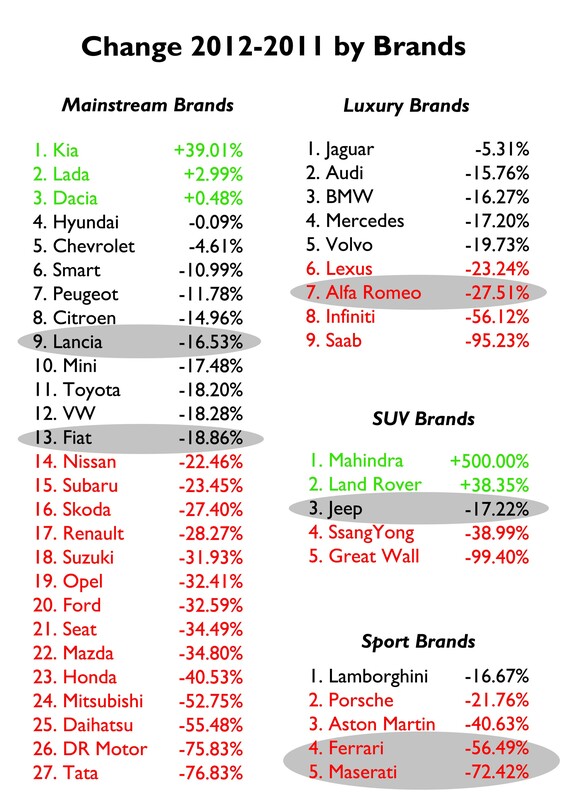 And from the whole list, only Kia, Dacia, Land Rover, Lada and Mahindra increased their sales figures. The case of Kia is amazing: it was up a massive 39% thanks to its 7-year warranty program and the great designs and quality on its models. 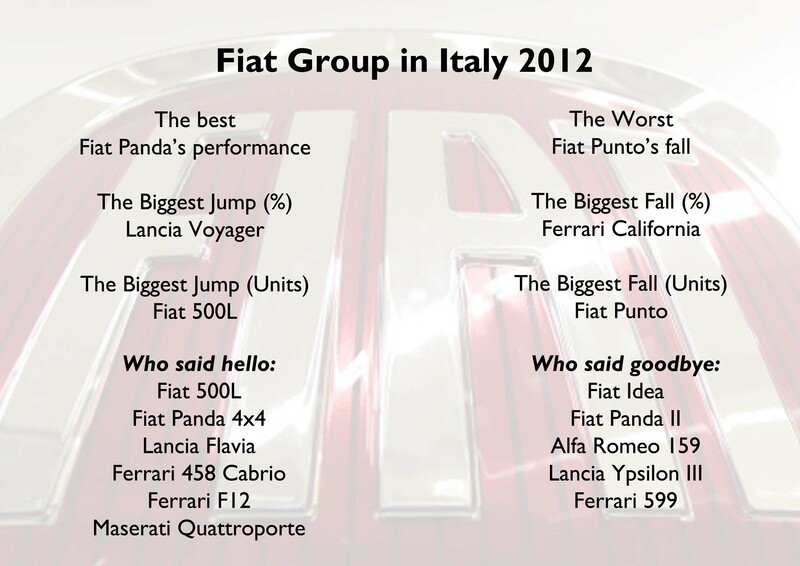 If it continues like that, in 2013 it could overcome Alfa Romeo in the ranking. Other important facts come from Peugeot and its 208, which helped the brand to fall only 12%. 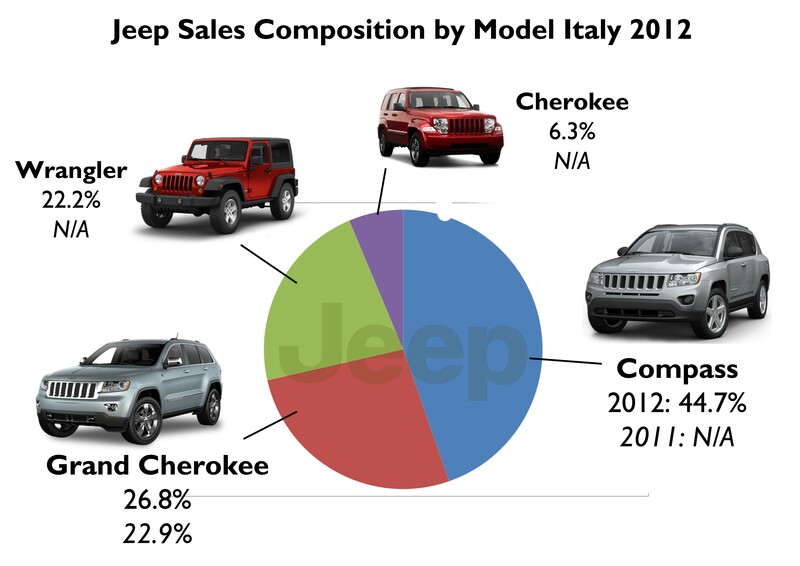 Too bad for Jeep, that is once again overcome by Land Rover, which almost doubled it thanks to the Evoque. 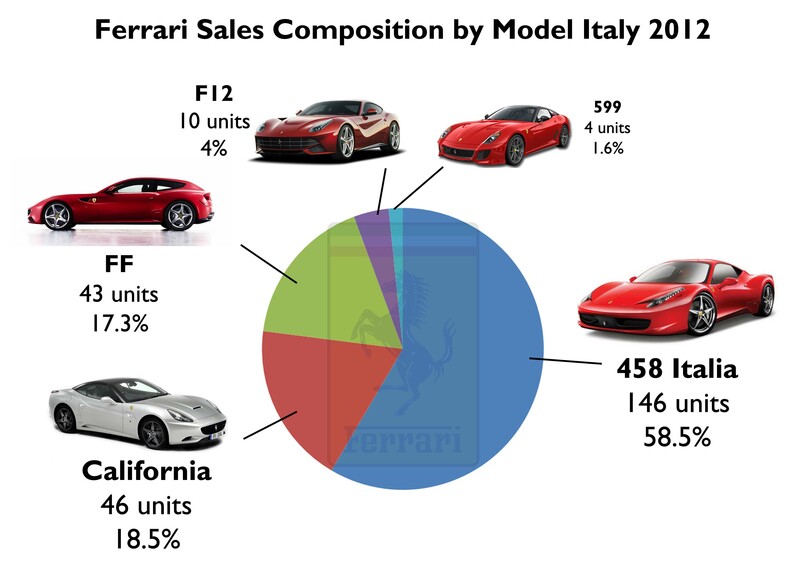 From the 36 models the group sold in Italy in 2012, only 6 count 80% of the total. It means that 17% of the offer makes 80% of the demand. The Panda was the best-selling car of the market and was up a tiny 2%, which helped somehow to stop the fall of the Punto, down a massive 35%. The bad result of the Punto is perhaps the worst result of the name plate since it was launched in 1993. Nevertheless, it was not the only B-Segment model to fall dramatically. The Fiesta, Corsa, Polo and Ypsilon had terrible falls too. Only the Peugeot 208/207 and Toyota Yaris had good results. 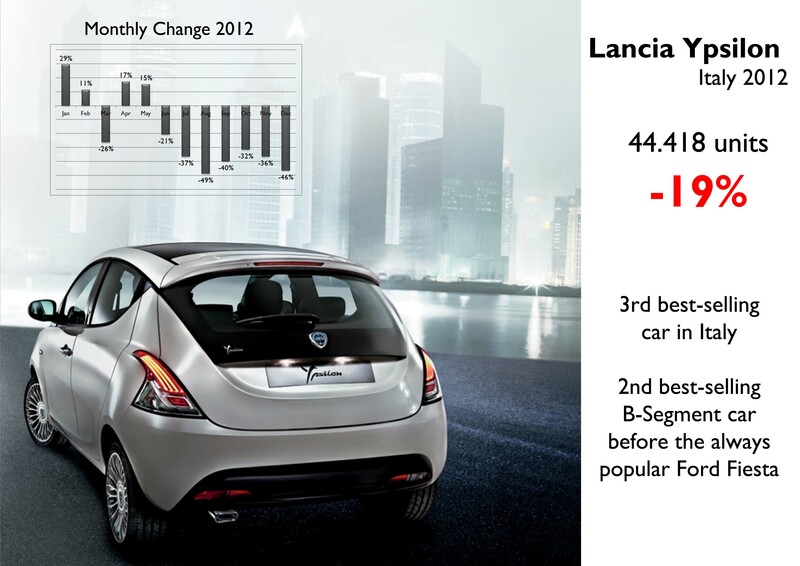 The third and fourth place go to Lancia Ypsilon and Fiat 500. 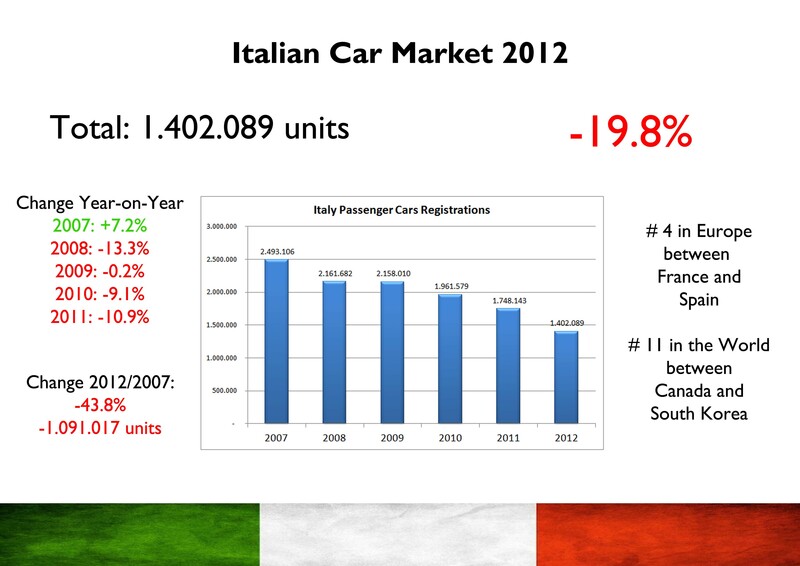 In 2012 Italy stopped being Fiat 500’s largest single market as sales in USA were higher. The ‘Pareto’s principle’ is closed by the Alfa Romeo Giulietta and Lancia Musa. The Giulietta did its best (with special editions and the 105 cv version), but it was not enough, even though it overcame the Golf as the best-selling compact car in some months of the year. The case of the Musa is weird. It is a pretty old model and its production was halted in 2012 in Mirafiori plant as it is the same of the Fiat Idea, replaced by the 500L. 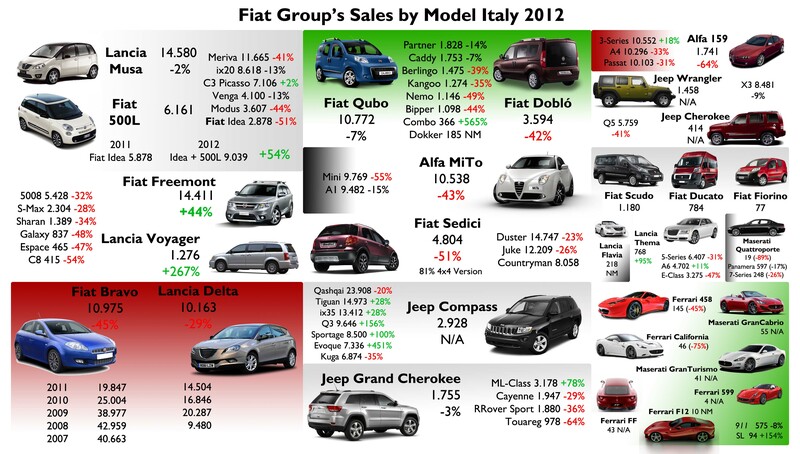 However its sales fell only 2% and it was the best-selling small MPV in Italy. Is not good to think that Fiat stopped its production without a clear successor. The Musa is closely followed by the Fiat Freemont, which had its first full year on sale and therefore its best result ever: up 44%. Then, it was by far the best-selling big MPV in the country. After the Freemont there are the Bravo, Qubo, MiTo and Delta, which sold a bit more than 10.000 units each. That’s nothing for the type of cars they are. Taking into account their age, the Bravo, MiTo and Delta should sell much more. In 2013 the Bravo and Delta will die to welcome the arrival of a model to be manufactured possibly in Turkey using Fiat Viaggio’s base. 84% of total sales correspond to regular passenger cars, while MPV accounted 9%. 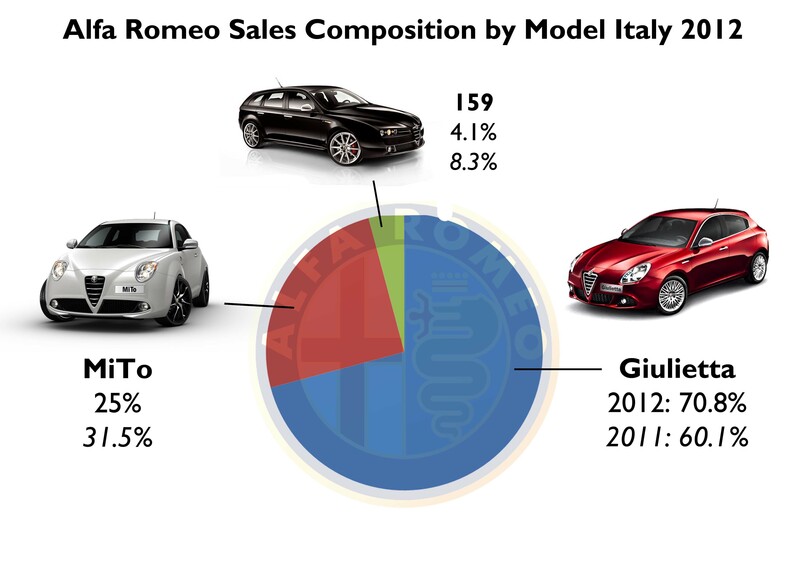 In the case of SUVs, only 3% of the group’s sales in Italy correspond to this kind of cars. Passenger LCV (those original LCV that are used as passenger cars) accounted 4%. And finally Sport cars represent 0.1% (344 units). If one compares these results with total markets’, the conclusion would be that Fiat is really weak in those segments that are growing fast (MPV and SUV). Among regular passenger cars, there is another big concentration: 46% of those sales stay in A-Segment, 39% in B, and only 15% in C-Segment. D, E and F segments account 0.8% of total regular passenger cars. Fiat sold 118.000 units of its Panda and only 1.700 units of the 159. That’s a big difference between models of a same group. In the universe of MPVs, the situation is pretty equilibrated: 60% of their sales correspond to B-MPV, and 40% to D-MPV, as neither Fiat nor Chrysler offer a mid-size MPV. With the SUVs the share is pretty equilibrated among segments. 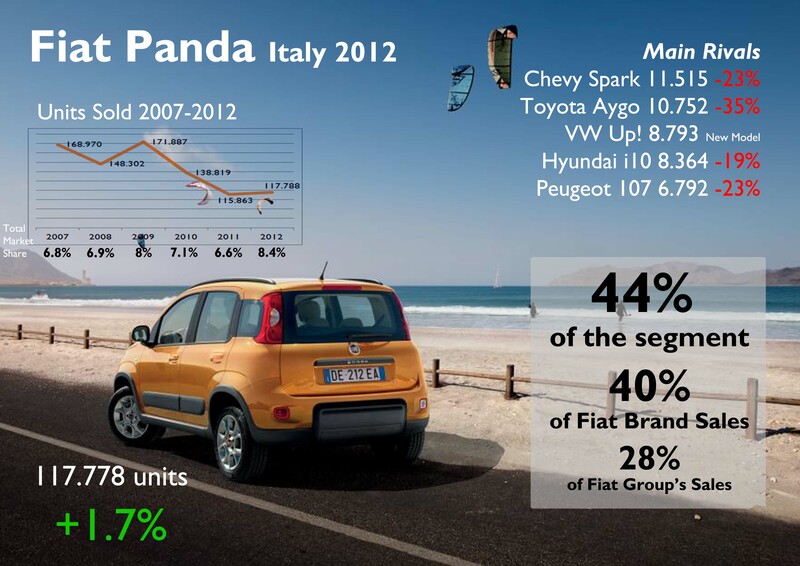 Regarding the origin of the models, Italian products ranked first with 67% of the total (due to the fact that Panda’s results include second and third generation, and they are manufactured in Poland and Italy, this analysis considers only Italy as the production site for the Panda). The fact that 2 out of 3 Fiat cars sold in Italy are locally made should be a good reason to stop thinking that Fiat is leaving that country. It is true that some of the key models are made outside, but Italy continues to Fiat’s largest market in Europe and its main production site in that region. Along with full year analysis, I will try to make my own forecast for every market analyzed. Using my professional experience on sales forecast and budgets, and based on my knowledge of car industry and the information I’ve got so far, I will predict how Fiat-Chrysler’s sales will be in 2013. Anyway, it is just a prediction exercise. In the case of Fiat-Chrysler in Italy, it is my belief that the group will keep its share but as it will happen to total market, sales will fall a little bit compared to 2012. In the first months total sales may continue to fall a double-digit number, but it is expected that in the second half of the year, sales will stabilize. Fiat Group will move pretty much like the market even though it will have problems with the old Punto, which will fall even more (up to 60.000 units). 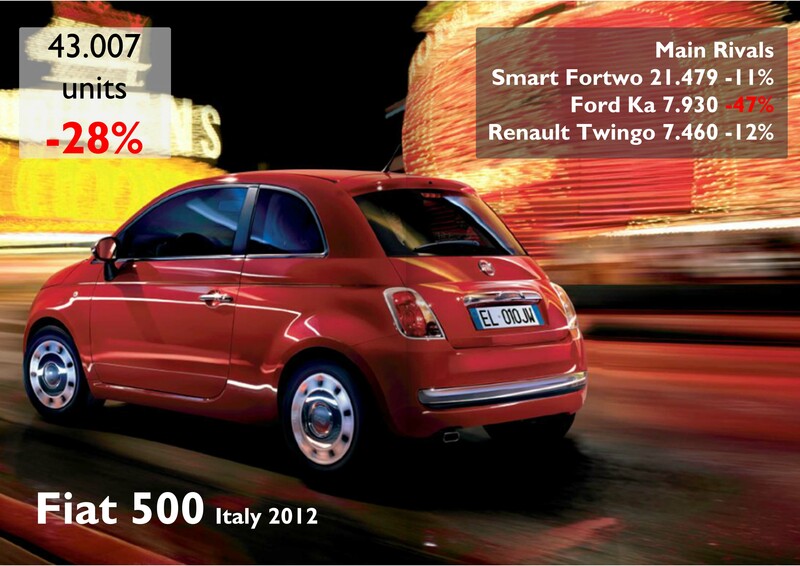 Good news will come from the 500L which could sell about 30.000-35.000 units. Alfa Romeo will fall more than Group’s total, due to the fact that the Giulietta will face a tough competition from the new Golf and its facelift will not arrive before late 2013. 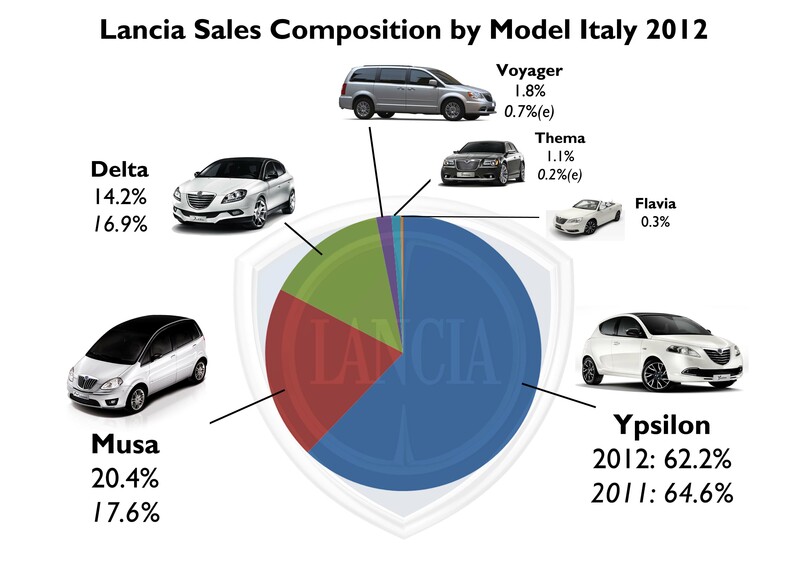 Lancia must work hard to reposition the Ypsilon and stop its extreme fall. Otherwise, without a Delta and a Musa, it will fall drastically (50.000 units). 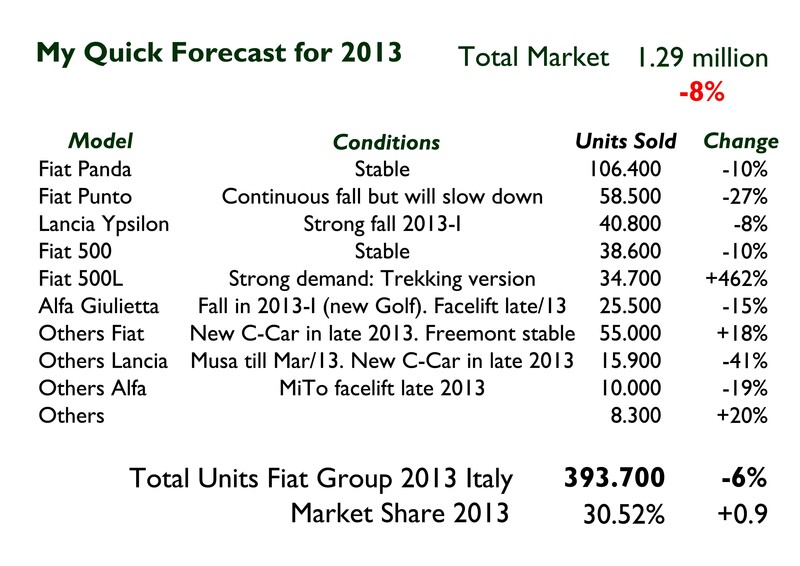 In conclusion 2013 will be a difficult year for Italian market but not as it was 2012. In this scenario, Fiat will behave the same, but there are some risks that must be considered in order to avoid a worse result. This could my very first forecast for car industry. I believe total market will continue to fall in the first semester but at lower rates. In the second semester it is expected a zero growth to end the year (December) with a bit positive growth (5%). Then I assume several things that should happen inside Fiat. First, the Panda will continue to rule but will see a bit slow down in the beginning of the year. 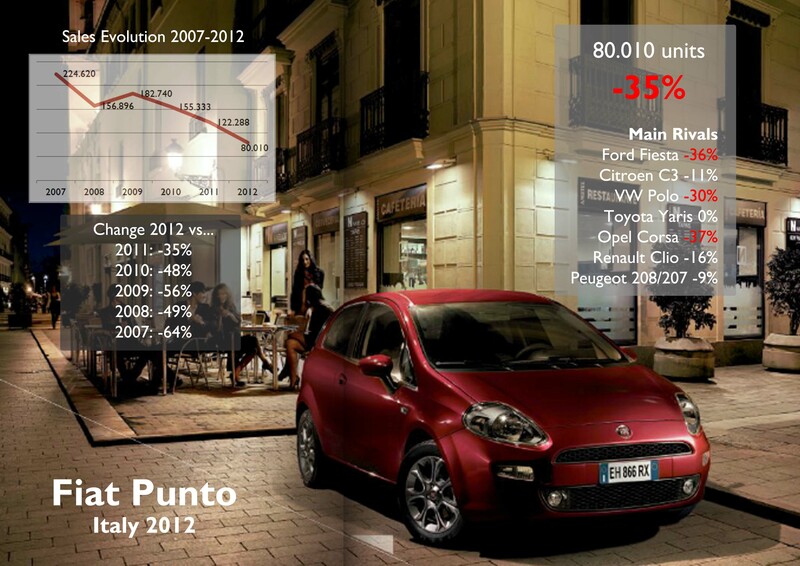 The Punto will continue to fall but not as it has done so far (the new Fiesta is going to complicate things). The 500 should be stable, so as the Giulietta. However, the Alfa will face tougher competition from the new Golf, so its sales may decline a bit. The 500L is expected to be a boom thanks to offroad versions. I also think that Fiat may be launching a new C-segment car by the end of the year under Fiat and Lancia brands. By that time, the facelift of the MiTo and Giulietta should also be available. ← Alfa Romeo in USA this year! Lots of great analysis, Juan Felipe. I am generally in agreement with your conclusions, and even your 2013 forecast. Thanks thysi (hope it works to find a job with Fiat). Maybe I was confused when comparing both results. However VW has a big advantage as a brand or as a group. Now I’m working on USA report. Bye! Veramente. Sto per finire USA 2012. Ci mette tempo eh? Vi avevamo inviato un email di risposta in cui vi chiedevamo se le fosse utile una tabella in cui sono scritti tutti gli impianti del Gruppo Chrysler negli Stati Uniti, in Canada e in Messico. Ma non abbiamo ricevuto risposta. Great write-up as usual. Will you be looking at FG sales in the rest of Europe too? Sure, most of all countries. My main problem: time! Thanks for your great information, the contents are quiet interesting.I will be waiting for your next post Japan used cars .